Steve Lovelace, you have inspired us, sir. To drink! The Dallas-based writer, photographer, and artist put together the wildly buzzy Corporate States of America map, with the logo of each state's most notable company shoehorned between its boundaries. 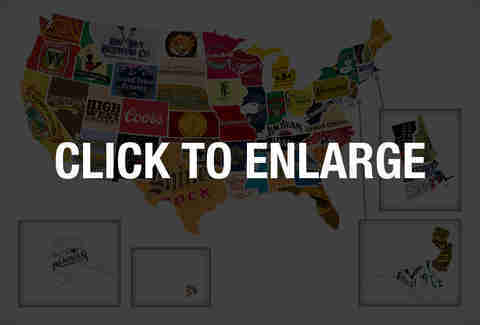 We noticed that only two were alcohol outfits, which drove us to create another map plotting the biggest/most high-profile liquor or beer companies from each of the 50. 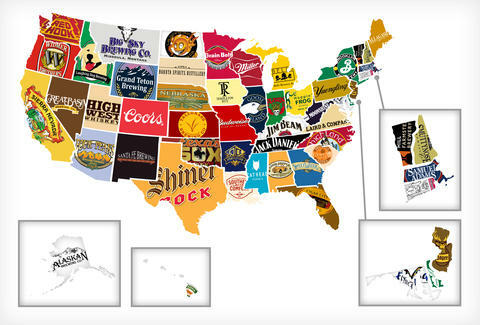 And we also know there are at least infinity amazing craft breweries in each of these states, but this map's about the big boys, at least when there are big boys to be noted. Don't agree with any of the calls? Please, let us know in the comments. And yes, turns out it's pretty hard to visually represent Jägerbombs for New Jersey when confined by small, oddly shaped spaces.